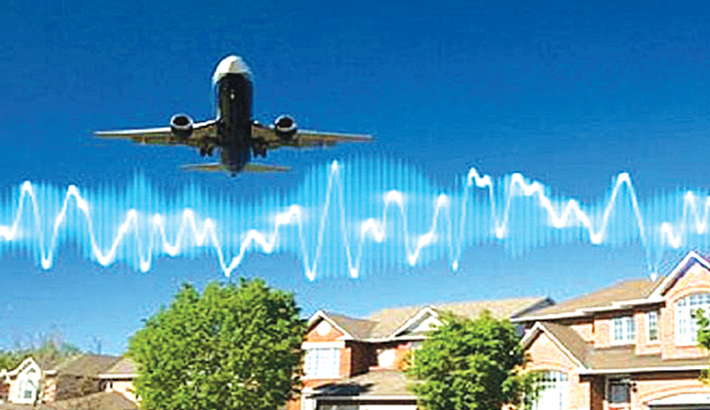 Aircraft noise is one kind of noise pollution produced by aircraft during various periods of flight. Nowadays, people are enduring noise pollution including aircraft noise enormously. Military jet and aircraft trouble people disturbing serenity and ease all over the country but more so in Dhaka city, and this aircraft noise has turned into ‘nuisance’. The word ‘nuisance’ is vastly used in tort law. In Bangladesh, we do not follow tort law, but since we are a common law country, we can follow its principles. The word nuisance means to annoy someone. However, military jet and aircraft noises are gradually increasing. A military jet, 50 meters from land emits 130 dB and a passenger aircraft (e.g. Boeing 707 or DC-8, Boeing 737 or DC-9) emits more or less 110 dB before taking-off or landing. Basically, the sound associated with a jet plane is measured between 120 and 140 decibels. Noises that reach a decibel level of 85 can cause permanent damage to the hair cells in the inner ear and may lead to hearing loss as well. The people adjacent to the airport are facing this problem as well as most of the urban dwellers of Dhaka city. When people are on phone call and when an aircraft or a military jet passes over them, they usually stop talking because they cannot hear the other side. This is the typical scenario of people living near an airport. Moreover, the roaring of military jets bothers infants or kids and parents protect them by keeping them close, also people who are outside get scared during that time. Aircraft noise has a lousy impact on the human body, such as health consequences include hearing impairment, sleep disturbance, annoyance, heart disease, decreased school and university performance, high blood pressure, workplace accidents caused by stress and other anti-social behaviours. Memory and recall can also be affected. When developed countries around the globe are concerned about aviation noise, Bangladesh has closed their eyes and they play a role of a spectator. Stansted airport in London try to reduce noise exposure at night by imposing flight restriction principles during night flying, and over the years, German airports have increased their noise-based charges, in particular for louder aircrafts. USA has been following noise mitigation program since1960. As a result, they have developed aircraft and better operating procedures which have minimised aircraft noises. Every person has the right to enjoy his/her property including the sky without any kind of interference. But when commercial aircrafts go over a house surpassing the limit of its roaring noise, it goes against rule and causes trouble to others. But under common law, a person who owns the soil also owns the space indefinitely upward, ‘ad coelum’. The term ‘ad coelum’ is a principle of property law, states that the property holders have rights not only to the surface land itself, but also to the air space above. The noise is not limited to the sky itself, but troubles some residential areas. People bothered at every hour of the day cannot tolerate it anymore. People who are facing aircraft noise problem everyday can feel the pain of this. Also, commercial aircraft noise force people to be stopped in certain circumstances. Recently Adam Ullman, a citizen of North Fair Oaks, USA - has filed a suit against the county for failure “to mitigate the continuous public nuisance of very loud aircraft (San Carlos Airport) flying over his home“. Where the county was found liable and Mr Ullman awarded $1,000 plus his $65 court filing fees. He won the case! As the percentage of aircraft is increasing in numbers, it is a matter of great concern. The authority should check with the aviation system whether it causes any public issue or not. By effective management and monitoring, the problem might be mitigated. Otherwise, a vast number of people would be victimised.